Friday 10th August 2007 started like any other day. 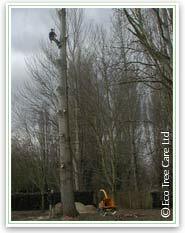 We took some of our usual calls for tree surgery quotes, woodland management and log deliveries. At about 11 am a withheld number calls, the man on the other end tells us he works for a TV production company and is looking for some wood. We tell him we have plenty, what does he want specifically? Eventually he comes clean and tells us he is calling from Big Brother. 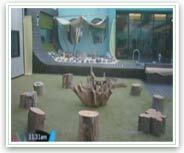 They are going to remove all the furniture from the Big Brother house and replace it with logs and furniture made out of planks. 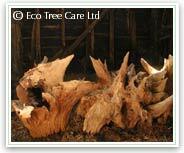 They want 25 log rings and as many sawmilled planks as we can give them within their budget. We agree and they send a courier to pick them up later that day. 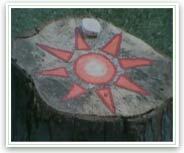 The planks are from a large poplar tree that we felled at Broadmeads in Ware, on the banks of the River Lea. 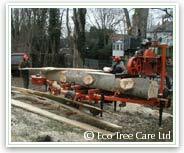 We often sawmill large tree trunks, where the access is possible, to recover as much useful timber as possible. We also offer one of the many old tree stumps that we have reclaimed from our woodland management and conservation work. These we have sandblasted to leave just the raw twisted and gnarly, beautiful wood, which are then made into furniture or just left as arty features for indoor or garden landscaping. 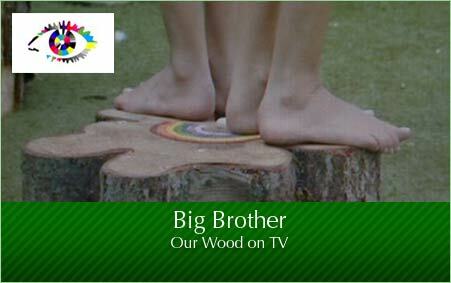 Big Brother thinks this a wonderful idea and they talk on the phone about putting it in the garden as a feature. The furniture is removed on Saturday night and four ‘sofas’, a table and two benches are constructed using our saw milled poplar and our logs. 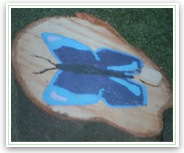 The sandblasted tree stump has been put into the centre of the garden surrounded by more of the round logs, each with a painted image such as a rainbow, butterfly, waves, mountains. Big Brother has named this ‘The Circle of Life’. It is around this that the housemates carry out their tasks this week. When the didgeridoo sounds the housemates each have to stand on the stump that they have been assigned and ‘worship’ the tree stump in whichever way they feel appropriate. 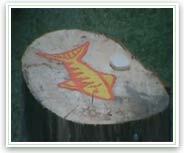 The house mates then unfurl themselves and dance on their tree stumps to the sounds of “The age of Aquarius”. After this the twins, Sam and Amanda, are instructed to remove the instructions from the rainbow stump on which they are standing and read them out. They then each are asked to turn to their left and tell the next house mate what they most like about each other. And so the show progresses, with more tasks and more shots of the housemates sitting on the benches or gathering around the stump in the circle of life. 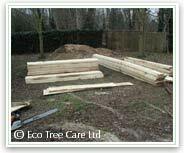 We at Eco Tree Care have found it hilarious to watch, thinking that only a few days ago these logs were sitting at one of our log barns in Much Hadham awaiting splitting and seasoning into firewood and now they are being stood on and sat on with one of our prized old stumps worshipped by the Big Brother housemates! All on national television watched by millions of people.